That title can be taken as you wish. 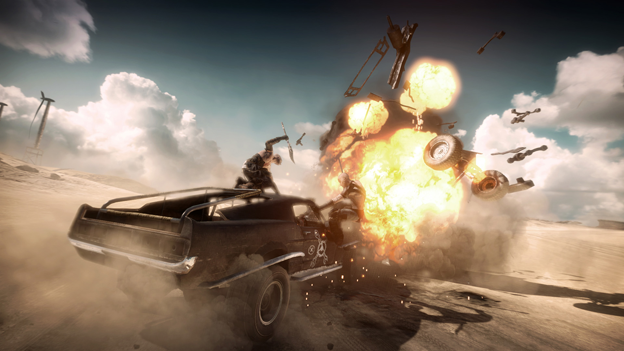 Some may view it from a positive perspective, admiring the striking yet sullen landscapes and exceptional though volatile cinematics which Mad Max has. 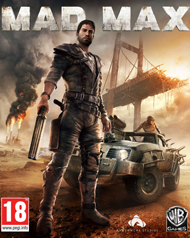 Others may take the title as a criticism of the monotonous tasks and generic gameplay, which Mad Max also has. I personally am enjoying my time with Max Rockatansky and his drifter persona. Many elements in Mad Max are sliced from other games, and the innovation is somewhat lacking, yet there are still plenty of satisfying moments, and a progression system that gives more purpose to scouring the wasteland than the uninspired story does. It starts out with high octane, though, as Max is pursued by a brigade of bandits and their psychotic leader, Scabrous Scrotus. Taking Max's vehicle for scrap, he is left to rot in the burning sand. Though Scrotus' flight from the scene is short-lived, literally, as Max boards his oversized throne-on-wheels and pierces his skull with a chainsaw. Max is thrown from the vehicle with nothing but Scrotus' former dog to limp him in the right direction. Max is soon introduced to his would-be partner in plunder, Chumbucket, a hunchbacked zealot with a head for mechanics who believes Max is a saint sent to help fulfill his holy mission of building the Magnum Opus, a vehicle of unparalleled craftsmanship and fortitude. In order to get the Magnum Opus pimped to epic proportions, scrap, the game's only currency, must be plucked from dead enemies, destroyed vehicles, and scavenged around abandoned caches and fortified camps. The amount of customization is extensive, with upgrades to engines, chasses, rims, hood ornaments, and many other components that are practical as well as superficial. The downside is that higher tiers are only unlocked through story progression, making the process more linear than liberating. Max himself can be upgraded with various passive bonuses and new combat moves, though again, higher levels are only unlocked after reaching milestones of experience. Melee combat will be easily recognizable to anyone who has played the Batman: Arkham games. 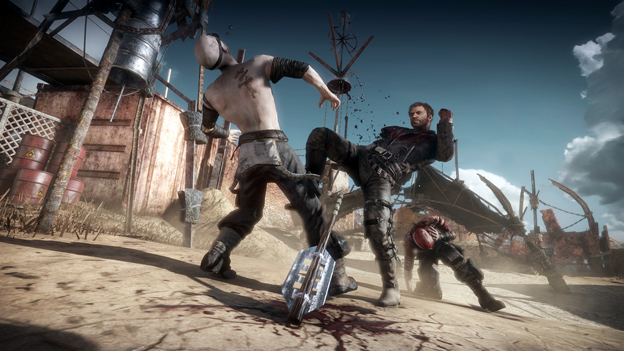 Though more brutal than the Caped Crusader's non-lethal attacks, Mad Max is a much more rudimentary system. Switching between attack and parry is about all that is required to defeat a dozen or more enemies surrounding you. The game offers some flair in the form of temporary weapons and shotgun or shiv one-hit kills (neither of which is necessary nor recommended due to very limited ammunition). Some enemy attacks cannot be parried, thus you must leap out of the way, and brutish bosses require a little more finesse, not aided by poor camera controls. Each final blow is presented with a slow-motion flourish. It's an enjoyable yet redundant endeavor that doesn't seem to evolve into anything more substantial. Vehicular combat, on the other hand, is much more gratifying. There are plenty of options at your disposal when outnumbered by Scrotus' lackeys. Higher speeds means more damage with collisions, and swigging a nitro boost makes short work of the towering effigies called Scarecrows. The shotgun is more useful in the Magnum Opus, good for blowing bandits out of the driver's seat, blasting tires to shreds, or igniting fuel tanks that translates into a resounding explosion. The harpoon can yank snipers from their perch, tear down gates, or simply launch unfortunate souls across the wasteland in a magnificent display of ragdoll physics. Side-mounted flame throwers and massive spikes on the frame add even more combat prowess to the Magnum Opus. The wasteland is massive, and zipping around in your vehicle makes movement from one mission to the next a breeze. An interesting oil pipeline or gargantuan ship propeller belies the tedium to explore locations of "interest". You'll find scraps, snippets of history predating the apocalypse, and water that serves as a tonic to regain lost health. More enemies will charge you, a stray sandstorm may pop in for added effect, and enemy threats are whittled down. Your progress towards sanctifying the land and upgrading Max's abilities and the Magnum Opus is moved up a notch with each success, but it winds up being the same activity almost everywhere you turn the steering wheel. For a game that displays a junk strewn desert in such gorgeous detail, there is very little music during downtimes, which is a welcome retraction. While exploring unthreatened, the dune-forming wind is the extent of the audio ambience. Distant clangs of metal signify activity amongst the desolation, revs of passing engines promote the current way of life, but no grand orchestra pervades the speakers. A few churned melodies crescendo while in combat, and the score matches the visuals in ferocity through the cinematic cutscenes, but it strikes a great balance with the eerie calm during the non-combative moments.